It seems obvious but to do some walks of similar length to those you will be doing on the tour, in the weeks leading up to it, is a big advantage. Build up gradually, so that you start with shorter ones and work up to longer distances. One of the biggest mistakes you can make is to arrive on the tour with a brand new pair of boots. Wear them in! Your feet are of utmost importance, so make sure you have professional advice about fitting your walking boots and buy good quality socks which wick away moisture. If necessary, wear two pairs of socks to reduce the risk of blistering and do a bit of toe-nail management too! Not everyone is a gym member but any exercise which helps to build cardio strength is an advantage, such as cycling, swimming, squash or football. Think of a few simple lifestyle changes like using steps instead of the lift or escalators, and run up and down the stairs a few extra times each day. When out walking, practise on different terrain if possible and don't limit your preparation to hiking on pavements and flat tracks or trails. Including some steeper ascents and descents will start to build strength and stony or rocky surfaces will give your knees and ankles some practice and help to improve your balance. Walking in muddy conditions or sand helps to exercise different muscles too. You will only be carrying a small day pack but your neck and shoulders can feel stiff if those muscles are not accustomed to this activity. Once again build up gradually and start light, adding extra weight to the pack as you gain in strength. In your training preparation for the tours always remember to be well hydrated when walking and fuel up on nutrient-rich snacks such as nuts, dried fruits, oat bars or plain chocolate. We always carry snacks for the group and remind people to fill up with water at every opportunity. If you are aware of any strains or pains during your preparation period it is sensible to see a physiotherapist before you leave home, as early intervention is the key to getting better. They can assess your posture and movement and give specific activities to meet your needs. Aside from this practical advice, we have below a series of exercises and stretches which help to build up muscle strength, and soothe limbs after a day of journeying on foot. 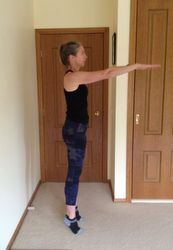 Anne Heuperman has been teaching Pilates to Jackie in her Mountain Pilates studio in Bright for six years. She very kindly agreed to put together the following advice for Hedonistic Hikers to help them start to prepare for the upcoming walking season! A strong core will help you stay light on your feet and maximize efficiency. Good balance and improved agility means you can focus on the scenery rather than where you are going to place your foot for the next step. The legs can take a battering while hiking, particularly the knees. Poor alignment of the feet and hips can lead to knee strain. Walking downhill, particularly over rocky, slippery terrain can cause hikers to over use their knees. An exercise program to strengthen feet, ankles and hips can be beneficial to take some of the load from the knees as well as improve balance and agility. Here are 4 Pilates based exercises and 4 stretches that are sure to boost your hiking experience. They are versatile, and can be done almost anywhere – but they are best done in conjunction with weekly Pilates classes with a certified Pilates Instructor. Standing tall, lift both heels off the floor. You can use a bench or back of a chair for support if needed. Modification/progression – try single leg heel raises. Try on a softer surface (carpet, grass, sand). Squat, reaching your bottom as far out behind you as possible. Aim to keep your shin as vertical as possible – use a mirror to check. Modification/progression – prop heels on a rolled up towel. Hold on to a vertical bar/door handle for support. Lie on your back, knees bent and feet and knees hip width apart. As you breathe out begin to peel your bottom, lower back and middle back off the mat reaching your tailbone towards your knees as you go. This is different to a yoga bridge, so keep your shoulders on the mat and don’t arch your upper back. Reverse the movement, by sinking the sternum, then placing each vertebrae on the mat one by one as you lower your spine back to the starting position. Modification/progression – squeeze a soft ball between your knees at the top. Lie on your back with your feet off the floor as pictured. As you exhale, begin to lower one heel half way towards the floor, and bring it back up. Repeat with the other side. As you get stronger you can increase the distance you lower your heel, until it taps the floor. All these stretches are best if they are held for at least 30 seconds – breathe in and out deeply at least 5 times for each one. Bring one heel towards your bottom and hold the foot. Use a strap around foot if needed. This is more effective done lying on your front, but can be done standing – but make sure that you keep your thigh in line with the rest of your body. Hang your heels off a step, or prop the ball of your foot up on a block to stretch your calves. Lying on your back use a strap, belt or towel to support your leg as you raise it towards the ceiling. Keep your leg straight and stop when you first get a stretch. Lying on your back with knees bent, place one ankle on the opposite knee. If you need to, lift your foot off the mat supporting your leg with your hands behind your knee. This can also be done sitting, by placing an ankle over the opposite knee and leaning forward with a straight spine. Many thanks to Anne and, now we know what to do, there are no excuses for not getting started with our preparations!